Royal Giant in... BOOM BEACH? 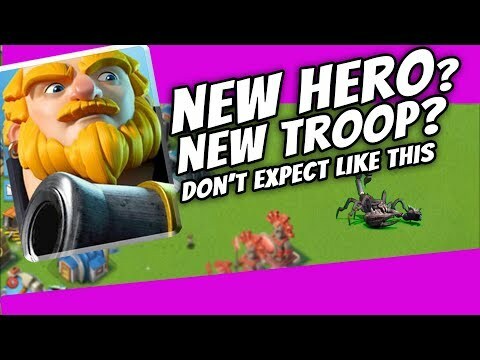 Who would have thought that the Royal Giant would actually appear as a Hero to Boom Beach? He is called G.I. Ant there and he outranges a lot of buildings, unlike his awful Royale counterpart. He also has a special ability which is similar to Hunter's attack. Would you like something similat come to Clash Royale as well? A more conditional Royal Giant? No thanks. It's like adding a slower but tankier Hog Rider or adding 2 rascal girls as a card. Though, i might look abit bias about this but let's think for a second. This troop targets building from far and it's tanky. Then it deals a pretty small damage but still very annoying like the old Royal Giant. However, placing anything in front of him will be demolished-so melee units won't work well. But at the same time, if there's a unit in front of him he won't land any damage to it's target (tower). Conclusion, less risk less reward RG (the 6.5 version). Seems like a fake video, and upon trying to look up this, it in fact is a mod for the game that was created on April Fools' Day 2017 on the Boom Beach Subreddit. Try to not mislead people into thinking that this is in fact real. So, please do try to check your sources before posting false content.